This is a snap of the Very Revd Gregory Dunstan, Dean of Armagh, kicking off proceedings on Friday, 6 June by welcoming us all to Armagh Public Library. On the first day of the conference we heard some great papers on Eighteenth-century archbishops, Jonathan Swift and Armagh, Jacobite women, and eighteenth-century tourists, as well as a keynote lecture from Aileen Douglas (TCD). After a very enjoyable day, we attended the conference wine reception at the ‘Bishop’s Palace’, an event sponsored by Armagh City and District Council. 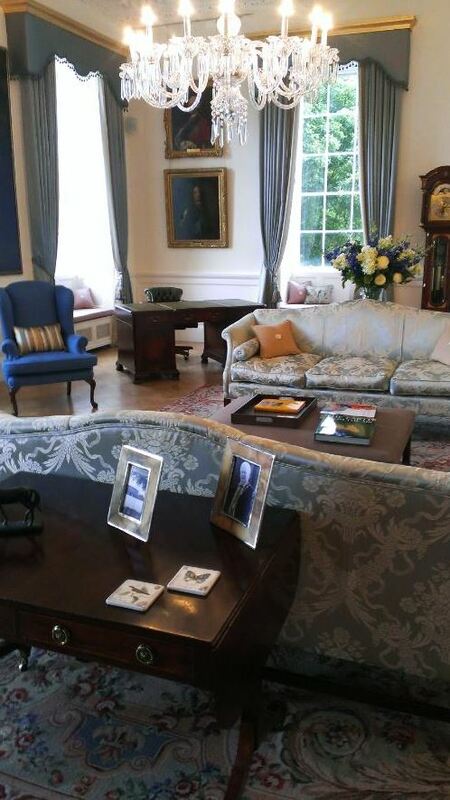 The wine reception was hosted by the Lord and Lady Mayoress of Armagh, Robert Turner and his wife, Barbara. 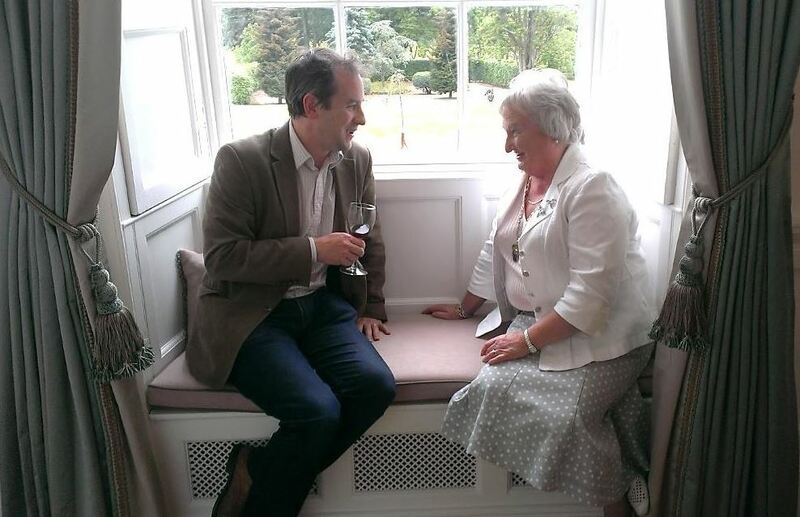 In the image below you can see David Fleming, Secretary of ECIS, chatting with the Lady Mayoress. Just after I took this photo, the Lady Mayoress was kind enough to bring a small group of us up to the top floor of the ‘Bishop’s Palace’ to show us some stunning views of Armagh. 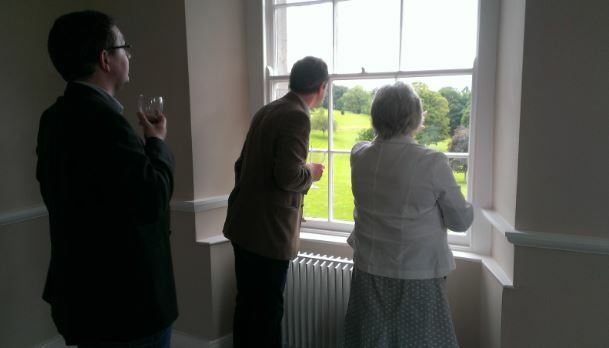 This is David Fleming, the Lady Mayoress, and Patrick Walsh, Reviews Editor of ECIS, admiring the views of the Bishop’s Demesne Public Park. After that, we proceeded to the conference dinner at the Moody Boar restaurant. The Saturday morning sessions were all held in the Cardinal Tomás Ó Fiaich Library and Archive. The sessions looked at Irish poetry, Molyneux, Swift, and Burke. Patrick Crotty (University of Aberdeen) delivered the Alan Harrison Memorial Lecture. The Ó Fiaich Library and Archive is located behind St Patrick’s Cathedral (RC). 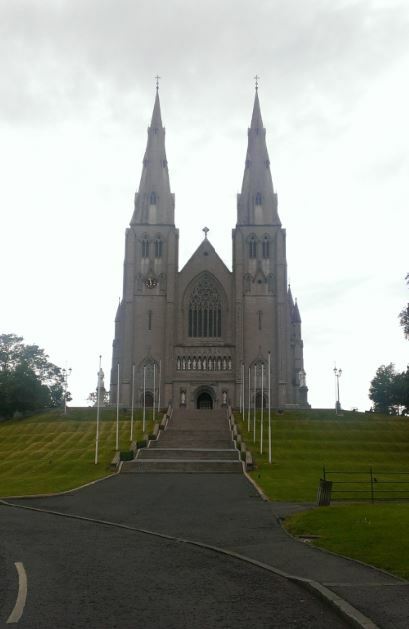 This is a photo of the cathedral but by the time I got up the steps I was no longer interested in taking photos! 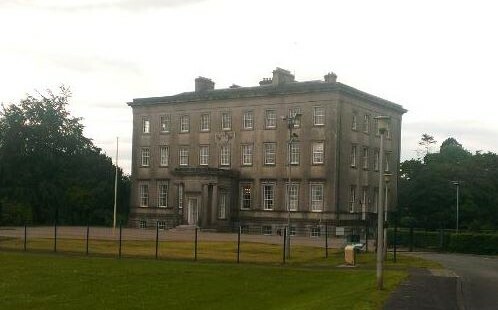 (If anyone has a photo of the Ó Fiaich Library and Archive, you can send it to blog@ecis.ie, and I’ll update the post). The keynote was followed by sessions on fiction, drama, and the mapping of the eighteenth-century Irish state. Then Eoin Magennis, President of ECIS, closed the conference. I did not attend the walking tour on the morning of 8 June, but if anyone would like to let us know how it went, please feel free to do so in the comment section below. Overall I had a great time at the conference, due in no small part to the wonderful choice of venues. I would like to congratulate Moyra Haslett for organising such a successful, enjoyable and engaging event!